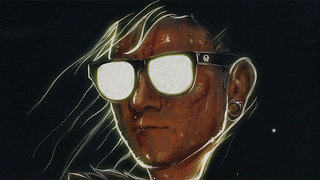 If you want to be the first to hear Skrillex's newest music, one of the easiest ways is to play some video games. The Grammy-winning DJ's first full-length record, titled Recess, isn't available by most conventional means. At the moment it can, however, be streamed through a free smartphone game called Alien Ride, which you can get on the iTunes App Store and Google Play. It's actually not a terrible game, though nor is it a particularly interesting one. It's a simplified Asteroids-like that unlocks the music shortly after you start to play. I played on iPhone and in a minute or two I had unlocked the album and was streaming it. The album came prefaced with a notification that it'll only be streaming through the app for a limited time, along with a link to preorder the album on iTunes. Skrillex's fondness of video games is well-documented, so it's not a stretch that he'd pull a trick like this. Still, I like it. More weird surprise albums, everyone!